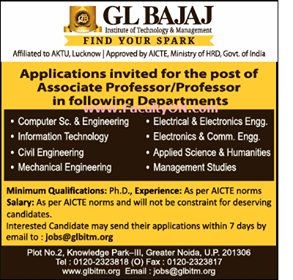 G.L.Bajaj Institute of Technology and Management, Greater Noida has advertised in THE TIMES OF INDIA newspaper for the recruitment of Professor plus Associate Professor jobs vacancies. Interested and eligible job aspirants are requested to apply with in 7 days. Check out further more details below. About College: G L Bajaj Institute of Technology & Management is the 6th Institute established under the prestigious banner of R.K Group. The institute is approved by All India Council for Technical Education (AICTE), Ministry of HRD Govt OF India and Affiliated to Dr. A.P.J. Abdul Kalam Technical University(Formerly UPTU Lucknow).